that will provide fresh fruits, vegetables, herbs, and honey at no cost to low-income Sussex County senior citizens at three farmers’ markets in the Rehoboth Beach/Lewes area. Funding for the program is provided by the Delaware Department of Agriculture and the United States Department of Agriculture. Delaware intends to request additional funding in future years and if granted, this will allow the program to expand to other areas of the state. The purposes of the Senior Farmers’ Market Nutrition Program (SFMNP) are to provide fresh, nutritious, unprepared, locally grown fruits, vegetables, cut herbs, and honey from farmers’ markets to low-income seniors and to increase the consumption of agricultural commodities by aiding in the expansion and development of local farmers’ markets. Seniors may register for the program at scheduled times at local senior centers. 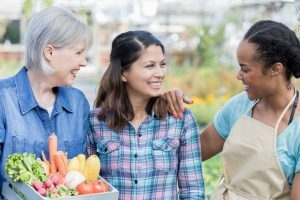 Eligible seniors will receive a booklet of four $5 coupons (for a total of $20) which can be used at participating farmers’ markets to purchase their choice of fresh, locally grown fruits, vegetables, herbs, or honey. Recipients may redeem the coupons through October 31 and may designate another person to shop for them if they are unable to attend a farmers’ market. have a household income not exceeding 185 percent of the current federal poverty guidelines. Coupons are distributed on a first-come, first-served basis, beginning in late June, and continuing while funds are available. Applications will not be mailed out and will not be accepted prior to June 26. A wait list is kept for eligible seniors who do not receive coupons due to a shortfall in available coupons. Tuesday, June 26, 9 a.m. to noon at Lewes Senior Center, 32083 Janice Road, Lewes. Additional distribution dates will be announced in July. Eligible seniors can print out the forms and complete them prior to attending one of the registration sites. Distribution of coupons is on a first-come, first-serve basis. Mailed applications will not be accepted. Historic Lewes Farmers’ Market at George H.P. Smith Park, DuPont & Johnson Avenues, Lewes, held Saturdays from 8 a.m. to noon. Historic Lewes Farmers’ Market at Kings Highway at Crooked Hammock Brewery, 37707 Crooked Hammock Way, Lewes, held Wednesdays from 8 to 11 a.m.
Riverwalk Farmers’ Market Downtown Milford, South Walnut Street at Riverwalk Park, Milford, held Saturdays from 9 a.m. to 1 p.m. NEW! Participants may only purchase from this list of eligible fruits, vegetables, herbs, and honey at the farmers’ market. For more information on the Senior Farmers’ Market Nutrition Program, contact Kathy Jackson, Department of Agriculture Marketing Specialist at Kathy.Jackson@delaware.gov.